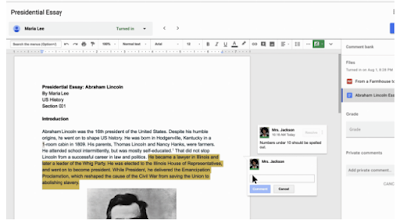 Google Classroom has recently introduced a number of interesting features and improvements to its overall functionality calling the update one of its 'biggest redesign’ since its launch. Here is a quick overview of the newly added features. You can also check this page for more details on each of these new features. Google Classroom introduced a new Classwork page to overcome the problem of class Stream being overcrowded. A single class Stream makes it hard for teachers and students to find content and feedback they have shared especially when there is a lot of content published on the same Stream. With Classwork page, teachers are able to organize content (i.e., assignments and questions) into modules and units. In this way, “ the Stream can be a better hub of class discussion and activity. It’s conveniently organized in a separate page to reduce clutter, so that students can have discussions in the Stream to develop their online communication skills within their classroom community“. This new feature allows teachers to copy existing assignments and topics and re-use them in another class. Anything copied remains as a draft so teachers can customize it the way they want. Classroom now has a unique page where teachers can access the settings of all classes and through it they can modify class descriptions, control what and how students use Stream, show or change class codes and many more. Using the People page, teachers will be able to view co-teachers, students and guardians. As its name indicates, this new feature allows teachers to disable all notifications from a specific class.